I spent a lot of time with Punkie this weekend. I enjoyed it so much. He really is an incredibly loveable guy. I am shocked by how fast he is changing. It seems like he figures out how to do something new almost every day. He is bright-eyed, and he jabbers at all in a constant stream of baby talk. Every time he “talks” to me, I just love him more. He isn’t quite crawling yet, but he covers a lot of ground by rolling. He rolls everywhere, but just in the one direction because it hasn’t occurred to him yet that he can roll the other way too. 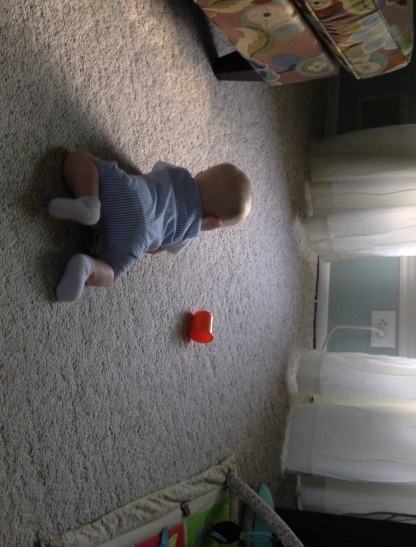 It’s just a matter of time, really, until he’s crawling. This weekend, we were playing on his play mat and he was working very hard to crawl – he yelled with frustration after a while, but he did bust out some forward-motion progress. He wants to crawl in the biggest way. Which brings me to this – OH MY GOD, WE HAVE TO BABY PROOF THIS HOUSE! Can you see the outlet in this photo? It’s a death trap. Punkie is aiming his body right at it! I’m thinking about taking a day off from work to baby-proof. I don’t know when I’ll be able to do this otherwise, and it seems like Punkie is progressing far faster than I am in this area. We have to secure the television, lest it fall on his head. And install baby locks. And baby gates. And door knob covers. And outlet covers. It’s time to lock this place down. This entry was tagged baby development, baby milestone, baby proofing, baby talk, crawling, mommy blog, rolling. Bookmark the permalink.